Is Eli Manning or Tony Romo the more superior quarterback? Published: May 22, 2012 at 11:59 a.m. 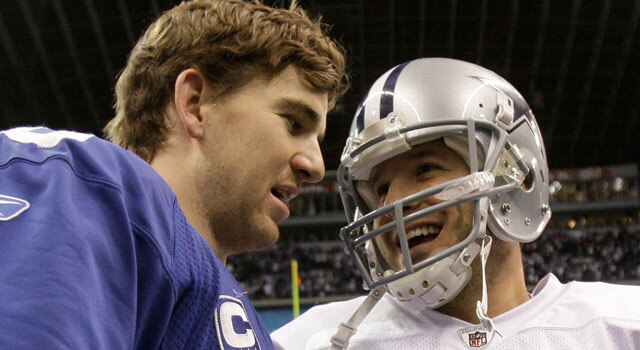 While Eli Manning (left) has a pair of Super Bowl rings, Tony Romo boasts the raw skills evaluators salivate over. Editor's Note: On Thursday, former NFL wide receiver Amani Toomer made headlines when he told SirusXM NFL Radio that Dallas Cowboys start Tony Romo was the best quarterback in the NFC East. The statement was widely viewed as a slight to Eli Manning, Toomer's former teammate on the New York Giants. The debate that followed Toomer's remarks brought to mind the below piece that NFL.com's Bucky Brooks penned back in May, which we're repurposing today for your reading pleasure. Enjoy. How do you measure a quarterback's greatness: wins or production? That's the debate among evaluators when determining which quarterbacks deserve to be labeled elite in the NFL. While most NFL coaches and scouts favor quarterbacks with proven track records of postseason success, the overemphasis on playoff performance can cloud the evaluation of some of the game's premier players at the position. In the case of Eli Manning vs. Tony Romo, the aforementioned standard makes for an interesting dilemma when determining who is the better player. Manning, a two-time Super Bowl champion/MVP, is coming off the best season of his eight-year career, with career highs in passing yards (4,933) and yards per attempt (8.4), as well as unparalleled fourth-quarter brilliance. He took his game to another level in the playoffs, connecting on 65 percent of his throws for 1,219 yards with nine touchdowns and only one interception. In addition to his spectacular stat line, Manning made a number of clutch plays, including his 38-yard strike to Mario Manningham on the New York Giants' game-winning drive in Super Bowl XLVI, with the outcome of the game hanging in the balance. Romo, on the other hand, quietly enjoyed another exceptional season at the helm of the Dallas Cowboys' offense. He finished the year ranked fourth in the NFL in passer rating (102.5), while completing 66.3 percent of his passes for 4,184 yards with 31 touchdowns and only 10 interceptions. Remarkably, Romo has completed at least 61.3 percent of his passes and compiled a passer rating over 91.0 during each of his six seasons as a starter. Although the Cowboys were roundly criticized for their inability to capture the NFC East after sitting atop the division for most of the season, Romo played well down the stretch -- completing 72.1 percent of his passes for 1,158 yards with 10 touchdowns and one interception during the final month of the season -- despite suffering a severely bruised hand in Week 16. Romo is one of the elite arm talents at the position in the NFL. He is a strong-armed passer with the ability to make pinpoint throws to any area of the field. His combination of zip and velocity stands out when he fits balls into tight windows between multiple defenders on short and intermediate throws. Romo also throws an exceptional deep ball with outstanding touch on balls thrown beyond 40 yards. He routinely lobs high-arcing passes down the boundary to streaking receivers in stride, and his precise ball placement is extraordinary. With the deep ball making a comeback in the NFL, Romo's ability to push the ball down the field is a huge asset. Manning is not as physically gifted as Romo, but he certainly possesses upper-echelon arm strength. He shows outstanding zip and velocity on intermediate throws, and is certainly capable of fitting balls into small windows at all distances. Manning's supreme confidence in his strong arm will occasionally lead to turnovers, but it also produces big plays at critical moments. Manning also tosses a fine deep ball, displaying excellent timing and anticipation on vertical routes. While he lacks the pure arm strength to routinely heave tosses beyond the 55-60 yards, Manning's ability to get the ball out of his hand quickly with arc and touch allows him to connect with his receivers on vertical routes behind the defense. Last season, he finished with 18 completions of 40-plus yards, and the majority of those were the result of brilliantly timed bombs lofted well before the receiver made his break at the top of his route. Romo is one of the finest athletes at the position. He impresses with his ability to move around within the pocket and is often at his best when forced to play the game in an improvisational manner. Although Romo has never racked up significant yardage as a runner, his ability to threaten the defense on the edges routinely leads to big plays. With athletic quarterbacks currently valued at a premium, Romo's elusiveness and ability to ad-lib makes him difficult to defend inside or outside of the pocket. Manning is not an athletic playmaker in the pocket, but he is nimble enough to buy time against pressure with his footwork and lateral quickness. From stepping up into open alleys to fleeing on surprise scrambles, Manning's ability to extend plays is a testament to his grit, toughness and underrated mobility. Given the speed, quickness and athleticism of the game's top edge players, Manning's uncanny knack for avoiding pressure is exactly what scouts are looking for in traditional drop-back passers. Romo has been taken to task for his untimely turnovers, but a closer look suggests that he is one of the game's best quarterbacks when it comes to ball security. Since tossing a career-worst 19 interceptions in 2007, Romo has kept his turnovers in check by routinely resisting the temptation to force the ball into traffic. As a result, he has maintained an interception rate below two percent in his each of his past two full seasons, which is impressive considering he attempted 520-plus passes in each year. While those numbers certainly point to Romo's maturation as a game manager for the Cowboys, he still baffles evaluators with some perplexing decisions in critical moments. From his three-interception performance against the Detroit Lions to his errant toss into the awaiting hands of Darrelle Revis in a gut-wrenching loss to the New York Jets, Romo's biggest mistakes have cost the Cowboys dearly in close games and led some to speculate about his ability to seal the deal with the game on the line. Manning has been lauded for his game-management skills, but perennially ranks among the NFL's leaders in interceptions. He led the NFL with 25 interceptions in 2010, and finished seventh in the league with 16 picks last season. Manning's propensity for turning the ball over certainly ranks as a concern, but he is a high-risk/high-reward playmaker with a penchant for getting it done with the game on the line. Consequently, you are able to live with his mistakes because he has a long track record of playing at his best when games matter most. Just look at his efficient play throughout the 2011 postseason as an example. Manning compiled a passer rating over 100 in three of the Giants' four playoff games, including his 103.8 mark against the New England Patriots in Super Bowl XLVI. With Manning able to manage the game superbly throughout the pressure-packed postseason, it is hard to take issue with his game management or decision making at this point of his career. Romo's leadership skills have been in question since his memorable run-ins with Terrell Owens, but he has made strides in that area in recent years. It is not uncommon to see him whisper corrections to his young receivers and he has been more demonstrative with his displeasure of teammates' performances on the field. While those actions are a step in the right direction, Romo's leadership is truly measured by his ability to raise his teammates' level of play in critical situations. Thus, in looking back at the Cowboys' disappointing finish in 2011, I would have to downgrade Romo's leadership, despite his solid individual performance. The offense failed to score more than 14 points in three of their final five games. That's just unacceptable for a unit that features a trio of playmakers in Jason Witten, Miles Austin and Dez Bryant. With the quarterback asked to distribute the ball to the team's best weapons, Romo has to find a way to keep the Cowboys' top players involved and put them in a position to make plays consistently. With the season hanging in the balance in December, the Cowboys lost four of their final five games. The quarterback has to take the brunt of the criticism for this collapse. Manning, on the hand, has developed into one of the NFL's best leaders, despite his quiet demeanor. Rather than inspire his teammates with fire-and-brimstone speeches, Manning raises his level of play in crucial moments and puts the Giants' offense on his back. For instance, the G-Men struggled mightily on the ground last season, finishing dead last in rushing offense, so Tom Coughlin and Kevin Gilbride increasingly relied on Manning to act as the driving force of the offense. They deviated away from their balanced run/pass ratio, and put the game solely in the hands of No. 10. As a result, Manning nearly eclipsed 5,000 yards passing. While his production certainly stood out in 2011, it was his ability to consistently take over games in pivotal stages that demonstrated his leadership to me. Manning led eight game-winning drives last season and repeatedly dug his team out of adverse situations. That's the kind of leadership that teams expect from a franchise quarterback. Many NFL games are decided within the game's final two minutes, so the franchise quarterback must thrive in those moments. Romo has taken his share of criticism for coming up short with the game on the line, but he took steps forward in his development a season ago. He guided the Cowboys to four fourth-quarter comebacks in 2011, and finally displayed some of the poise required to thrive in the game's definitive moments. What was most impressive about Romo's heroics was his ability to bounce back from a poor late-game performance against the New York Jets in Week 1 to lead back-to-back fourth-quarter rallies the following two weeks. With most NFL fans clinging to the vivid memories of his spectacular failures (including a botched field-goal hold against Seattle in the 2006 wild-card round), Romo must continue to deliver in the game's final stages to reverse the notion that he's a late-game goat. Manning is about as clutch as it gets in the NFL. He has made pivotal plays on the biggest stages (the miraculous escape/completion to David Tyree in Super Bowl XLII, the aforementioned throw to Manningham in February's Super Bowl) and repeatedly shown his clutch demeanor with an 8-3 record in the postseason. With five of those wins on the road, Manning certainly has the "It" factor coaches and scouts covet in a franchise signal caller. The debate between Romo and Manning puts evaluators in a quandary when deciding whether to value raw talent and production over intangibles and postseason success. While Romo certainly possesses the skill set to guide a team to a championship, the fact that he hasn't been able to get the Cowboys over the hump prevents me from placing him above Manning. The reigning Super Bowl MVP has emerged as one of the league's best quarterbacks in the clutch, and his ability to win big games earns him the nod, despite the disparity in talent.